Machines will gradually become programmed using computers which have the knowledge of how the objects in the world relate to one another. This book capitalizes on the fact that products which are manufactured can be designed on the computer and that information about the product such as its physical shape provide powerful information to reason about how to develop the process plan for their manufacture. 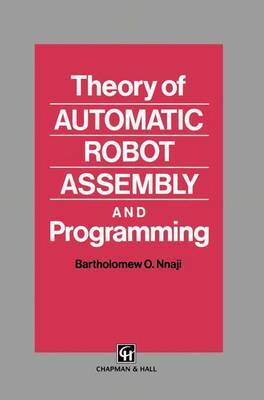 This book explores the whole aspect of using the principles of how parts behave naturally to automatically generate programs that govern how to produce them. The last decade saw tremendous work on how machines can be programmed to perform a variety of tasks automatically. Robotics has witnessed the most work on programming techniques. But it was not until the emergence of the advanced CAD system as a proper source of information representation about objects which are to be manipulated by the robot that it became viable for automated processors to generate robot programs without human interface. It became possible for objects to be described and for principles about how they interact in the world to be developed. The functions which the features designed into the objects serve for the objects can be adequately represented and used in reasoning about the manufacturing of the parts using the robot. This book describes the necessary principles which must be developed for a robot to generate its own programs with the knowledge of the world in the CAD system.